Our Secondary Teacher Education Program requires field-based learning and academic coursework. You will be eligible for certification after four consecutive quarters and meeting all other state and program requirements. 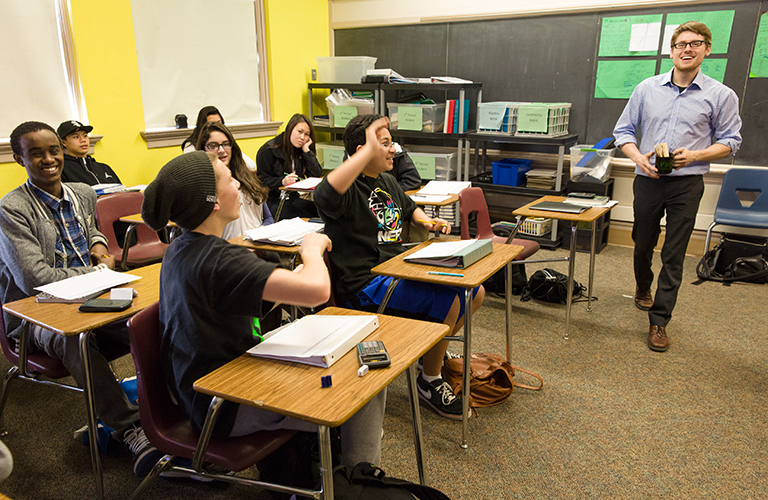 A hallmark of University of Washington (UW) teacher education, field-based learning provides significant work experience in school settings each quarter. Spring: Most subject-specific methods courses are taught, at least in part, in urban partner school classrooms, which are public schools with high levels of socioeconomic, ethnic, and racial diversity.. Courses are often co-taught by expert teachers and UW faculty known for their cutting-edge work in curriculum and instruction. Students complete a practicum in a middle school classroom that matches their content area. UW coursework is tied explicitly to the context of the practicum placement. Summer: You will learn to work with English Language Learners, to help students with reading and writing in your subject, and about multicultural education while working with groups of young people in a local high school summer bridge program for incoming freshmen. Autumn: Students start their student teaching placement at the beginning in the new public school year. You will spend the first month immersed in your school, then continue to work with your cooperating teacher's classes, approximately half time, when the UW fall quarter starts. We follow a co-teaching model of student teaching, in which the cooperating teacher and teacher candidate (student) share teaching responsibilities. Candidate responsibilities gradually increase throughout the quarter. A full UW course load continues throughout autumn quarter. Winter: During winter quarter, teacher candidate responsibilities increase, culminating in full responsibility for teaching the cooperating teacher's classes. There is also some UW coursework in adolescent development and learning. This is also when you will complete the edTPA, a national performance assessment required for program completion. The term ends with a Capstone Project. All candidates in a given cohort take the same course sequence. Below is a sample schedule that is subject to change.